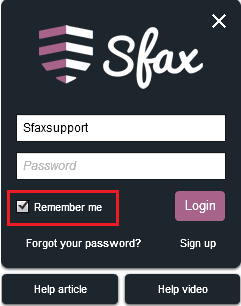 When logging into Sfax, you can utilize the “Remember me” option located below the password to have the WebPortal save your username for future login attempts on the specific workstation, or for the Sfax Print Driver to save your credentials for later send attempts. This setting can be enabled or disabled from your username, by logging into Sfax and going to Settings (the gear). This will display your user information to the right, under “User settings”. 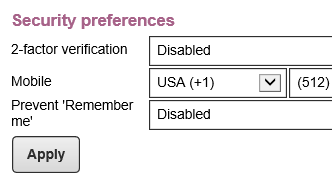 At the bottom of the window you will see “Security preferences” (unless your Account Administrator has customized privileges within your account). 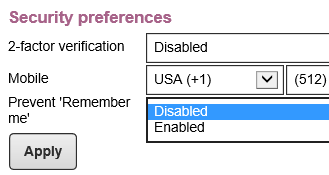 To change the setting, simply click on the dropdown menu and select either Disabled or Enabled. If this is set to “Disabled”, you will be able to utilize the “Remember me” feature. 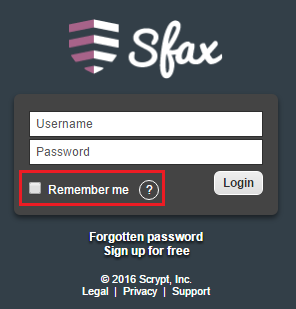 If “Prevent Remember me” is enabled, you will be unable to use this feature.